Large service centre just beyond the limits of the Australian Capital Territory. Queanbeyan is a city of 28 000 people located on the Queanbeyan River 291 km south-west of Sydney via Tarago and Bungendore and 18 km south-east of the centre of Canberra. It is essentially in NSW although parts of the city sprawl over the ACT border. Queanbeyan is situated at an elevation of 576 m.
Agricultural and pastoral industries are still strong in the area (sheep, cattle, wool, an abattoir, nurseries, honey, wine, hay and barley) while the city has strong building, manufacturing, service, retail, recreation and tourism sectors. Many residents work in nearby Canberra. Once occupied by the Ngarigu people, the first Europeans in the vicinity were the exploratory party of Charles Throsby. While searching for the Murrumbidgee River in 1820, they found and followed the Queanbeyan River into a valley at the eastern end of the Limestone Plains. This area was to become a natural stopping place for those crossing into the Monaro. Squatters were moving into the district from 1824. The first person to commence grazing on land near to the present townsite was ex-convict Timothy Beard who had established a property on the Molonglo River called ‘Quinbean’ (after an Aboriginal word meaning ‘clear waters’). Beard was an innkeeper from Campbelltown and preferred to remain there while three convict stockmen ran his western enterprise. However, he was ordered to quit the property in 1828. Although a township reserve had been established at Queanbeyan in 1828 nothing much happened until a post office and store were established in 1836 to serve the settlers. A police magistrate was appointed in 1837 and Queanbeyan was officially proclaimed a township in 1838, at which time there were some 50 residents. The first inn opened that year. As there was no proper accommodation in the new settlement the police magistrate initially established a court at Acton. A residence, known as ‘Dodsworth’, was built for him on the town’s southern boundary in 1839. Adjoining were huts for the court, lock-up and constables’ quarters. This collection was known as ‘Irish Town’ and the court was conducted here until 1853. The first hospital was also built here in 1847. In 1841 there were three brick and seven timber buildings at Queanbeyan. The first flour mill (wind-driven) opened in the 1840s. Bushrangers such as Jacky Jacky, Ben Hall, Frank Gardiner and John Tennant harried the district from the 1840s to the 1860s. Gold was found in the area in 1851, by which time the population had increased to 372. Lead and silver were also mined though not with remarkable success. The first bridge was opened in 1858, the first banking agency in 1859 and the town’s first newspaper in 1860. The 1861 census revealed 526 residents. Queanbeyan was declared a municipality in 1885. At that time there were eight hotels, four churches, two flour mills, a tannery and a lemonade factory, as well as dwellings and shops. The railway arrived in 1887 and the population was recorded as 1262 in 1891. Although it stagnated during the 1890s depression, the numbers were on the rise again during the 1910s and 1920s owing to the construction of nearby Canberra. This led to subdivision and closer settlement and stimulated building, employment and business activity. 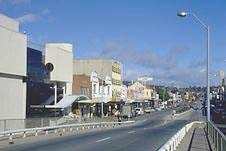 The initial unavailability of alcohol in Canberra was also a boon to Queanbeyan which has continued to prosper due to its proximity to the Federal capital. The population increased by 50 per cent from 1949 to 1958, passing 10 000 in 1963. It became a city in 1972. The Queanbeyan Show is held in November.